And I've Got The Answer For You!" "My children (grown adults) seem to think I look younger than my 67 years. This delights me to no end! Oh yes I was having a lot of hair breakage before taking (your new formulation) — lately I have noticed it has cut down on breakage." "I have been taking (your new formulation) for approximately 6-9 months. I have noticed that my hair seems thicker, and holds its color better." "I'm 67 years old. My hair was [starting to get thinner]. I was dreading the thought of slowly going bald. Since using (your new formulation) my hair looks and feels much healthier and is hardly falling out at all! I also noticed that my nails are improving — not brittle and breaking off as much. My energy level is up. I go ballroom dancing for 2 hours 4 times a week with my senior center group. Thanks for an excellent product." "Since I have been taking SHOU WU ... the most amazing thing that is happening to me is my hair is turning darker, it is very noticeable. 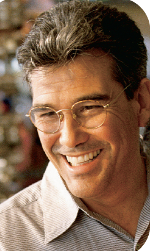 I am very happy with your product." "(your new formulation) has made a difference in my hair. It actually seems to have some life in it again! Thanks for a great product! I've only used it for 2 months." "I find it very helpful in two specific areas —thickness of hair and less hair falling out." If you have dull, lifeless hair you’re going to love this. My name is Jack Danforth. I'm the President of Healthier YOU, a 20-year old anti-aging product firm. Today I want to tell you about a fascinating "Chinese Secret" that I came across in my travels. I believe you'll love it, especially if you'd like to have stronger, thicker, nicer hair than ever before. Best of all, it works for both women AND men alike. Here's the story ..
My mother is 71 years old. Her hair had been thin-appearing and lifeless-looking for as long as I can remember. Her hair looked weak, thin and brittle. She often complained that she had to sweep it off her vanity every time she brushed it. It got to the point where you could even see some exposed scalp. She was terribly embarrassed by it. She tried every protein treatment, every conditioner, everything available — but nothing helped. Now, dad says Mom looks 20 years younger! Today my mother's hair looks beautiful — stronger, thicker and more bouncy and lustrous than ever! Her friends tell her she looks years younger ... (my dad notices the difference too, and he loves it!) You would never know she had a problem. She credits her new, fuller-looking healthy hair to an ancient restorative botanical I discovered while vacationing in China recently. When I first learned of this Chinese Secret I was especially intrigued because my own hair began losing its lustre when I was just 23 years old. I once treated my hair, but it did a lot more harm than good. Over the years, I had come to accept it, but I, too, had dull, lifeless looking hair. I hated it. I was at my wits end until a Chinese herbalist named Chen told me about this Chinese Secret. This Chinese Secret has been so effective that mom and I are both getting compliments on the appearance of our hair for the first time in years! I love it. It's done wonders for my ego! Healthy Hair, this Chinese Secret Can Help Restore Its Youthful Appearance! If I were to guarantee you a full head of youthful hair just for trying this Chinese Secret, you would probably have your doubts about our words and our sanity. For centuries, the Chinese have used this secret restorative herb. They speak of its ability to restore dull, thin-appearing hair to its original youthful thickness and luster — without sticky creams or artificial chemicals. I carefully researched the sources of this herb, and located an obscure supplier. Now I've created a product based on the Chinese Secret that Chen the old herbalist told me about, and I call our new product "SHOU WU." I honestly believe in SHOU WU. I know you will too. After all, Chinese herbology is the oldest, professional, continually practiced in the world – almost 5,000 years old! Currently, one-fourth of the world's population makes use of it! Herbal products from China are prepared in a variety of ways. At HEALTHIER YOU, we use only "extracted" herb powder as opposed to "ground" herb powder. Extracted herb powder is far more expensive to produce — up to 20 times more expensive, in fact, than regular ground herb powder. What does this mean to you? It means that our "Shou Wu" is powerfully "concentrated." How concentrated? Well, for every 120 pounds of herbs used in the manufacture of this "nature's wonder," only 10 pounds of pure extract is actually utilized. That is a 12:1 ratio. Super-potent in anyone's book! This translates into a clearly superior value for you. By the way, very few store-bought herbal products are made using this costly procedure — but rather they are simply herbs crushed into powder. Plus SHOU WU™ is for Men and Women! "I have been taking Shou Wu for over 3 weeks now and my hair has never been this soft and shiny before. Everyone at work noticed the difference. They asked me what new product did I use on my hair. I simply told them about Shou Wu and they were amazed. I love the difference it has made, so does my husband. Thank you." For many people (my mother and I included), "Shou Wu" enhances the growth and texture of hair. It restores the appearance of the thicker-looking, rich-bodied hair they had in their younger days. "I ordered your product "Shou Wu" only in the hope that it might return some life into what my stylist called "dry like straw" hair.The sheen I was looking for showed up within 3 weeks; and dark hair is now replacing the gray hair within 2 months of using your fantastic product. In today's world almost no product lives up to its advertising. In my case, Shou Wu surpasses my wildest expectation! Thank you for providing an outstanding product!" Now for the first time since the Tong Dynasty, a version of this time-tested original Chinese hair restorative is being exported to us, here in the United States. "Shou Wu" is not readily available in the U.S. or anywhere else for that matter. It is harvested in the mountainous He Nan and Wu Bei provinces in China. This amazing all-natural restorative supplement is extracted from an herb called Polygonaceae, as well as from the sought after root of the wild Eastern Rose plant. 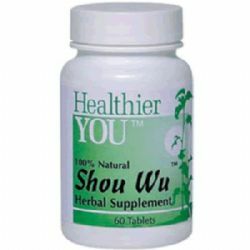 This special "Shou Wu" botanical has been tested on people all over the world, for centuries. Because it is all-natural, there are absolutely no toxic or negative side effects whatsoever. Also, please remember, because "Shou Wu" is an herb, you should not expect to see instant results. It takes a little time to tone the glands to function normally again. For most people, results may be seen in as early as 60-90 days. I hope you will try Shou Wu yourself – and that you will personally discover the Chinese secret to fuller, more lustrous looking hair and a more youthful appearance. Give it a try for 3 months or so. A real try. Don't be surprised if you, too, find yourself receiving compliments from friends and family. I hope you will try "Shou Wu" yourself — and that you will personally discover the Chinese secret to fuller, more lustrous looking hair and a more youthful appearance. Mom is thrilled. I think you will be too! You must be completely satisfied with your results, or I expect you to return the unused portion within 90 days for a prompt, full refund of the purchase price. Remember, I'm not satisfied until you are. To order, simply click here. Thanks for listening. P.S. Since "Shou Wu" is a Chinese herb — not a drug — it may take awhile to achieve the optimal results. It works gradually, but the results speak for themselves. Therefore, I highly recommend you start with at least two bottles. Preferably four. I'm genuinely excited about the results people are achieving with our "Shou Wu." I know you will be too. Remember, I guarantee it,or your money back! P.P.S. We only have a limited supply of "Shou Wu" on hand. The way things look, we could be sold out in no time. It will take 4 weeks or so to restock and I'm sure you don't want to wait. To avoid any disappointment, please click here to order today. We'll ship it to you within 48 hours. Try SHOU WU and discover the Chinese secret to fuller, more lustrous-looking hair and a more youthful appearance. Don't be surprised if you, too, find yourself receiving compliments from your friends and family. If for any reason you are not satisfied with your results,you may return the unused portion anytime within 90 days for a full and prompt refund of the purchase price – no questions asked. I'm are not satisfied until you are.